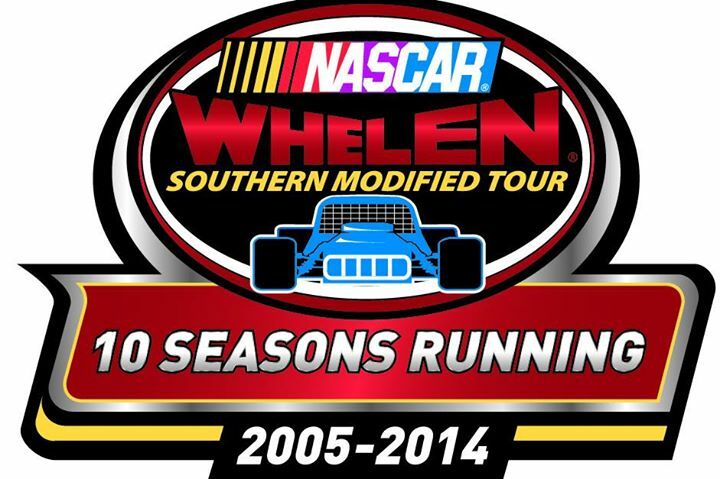 NASCAR’s Whelen Southern Modified touring series rolled through the small town of Hampton, Virginia for their first visit of the year. Langley Speedway was the playground for these 625 horsepower, wide wheeled, low riding power houses! I was worried for a bit that I would miss the race for the most part because I had to work my regular job till 9pm that evening, well lucky for me the support classes took a bit longer than usual to finish their events. I was able to get to the track, park and get into the track just as the cars fired up their engines. Earlier in the day Ryan Preece (@RyanPreece16) in the 41 machine set a blistering qualifying time at 14.675 seconds, a speed of 97.145 mph and that my friends is a new Langley Speedway track record! Andy Seuss (@AndySeuss) #11 started on the outside row one followed by Danny Bohn #65 in third. George Brunnhoelzl (@GB3) #28 would roll off the grid in fourth while Jr Bertucciou in the #2 car finished off the top five. We only saw three different leaders throughout the 150 lap race! Seuss honestly looked like he was going to be the much stronger car as the green flag waved over the field jumping out quickly to the lead but would be reeled right back in as Preece took the lead back on lap three. Your top three cars for a better part of the race, which never surprised me were Preece, Seuss, and GB3 who climbed up to third about 32 laps in, just waiting back saving his equipment. What I loved the most is those top three cars hardly let each other get more than a half a car link ahead of one another! Seuss would regain the lead by dive bombing Preece – now when I say dive bombing there was no contact the man just barreled his car into one and it stuck – with GB3 hot on his tail and would come out of two as your new leader, GB3 took advantage of the hole and took second place with Preece falling in like P3. Now even though this division is a touring class under NASCAR they take a mandatory caution half way through, in our case lap 75 was the magic number. The bad part about this yellow was Seuss & GB3 had just started to put some distance between themselves and the rest of the pack. However your top five at the break where Seuss, Brunnhoelzl, Preece, Bertuccio, and Bohn. I just can’t say that I like the stop at half way. There was some good side by side racing for position in the middle of the pack before the yellow waved. Now it’s not like the break is long, at most it was five minutes, also I must apologize because from where I was covering the race I was not able to see what adjustments were made during those stops. One thing is true what ever changes were made to the 2 car of Bertuccio you can be sure of he wishes he could have back. All night he was a solid top five car, comes out for the second half of the show and it was like he forgot where the gas pedal was! He fell off the pace big time and ended up finishing the race P2 and two laps down. Your other top five car at the break, #65 Danny Bohn was not able to finish the evening event dropping out of competition on lap 125 with mechanical issues. The Myers brothers, who had been running about mid pack for most of the evening, looked strong as the they put pressure on rookie Joe Osborne. Only took the two a few laps for one to open the door and both to capitalize and break into the top 10. However luck was not on Jason Myers side for the evening as he washed way up the track, and I am talking like dirt tracking it all the way through one and two. He was able to gether the car back up and no caution came out, Myers did not head down pit road and all four tires were still up the next lap. Only thing it could have been is he drove into one to deep or he and the #77 if Gary Putnam (who had already spun earlier in the evening making contact with the wall in turn 1) made contact. 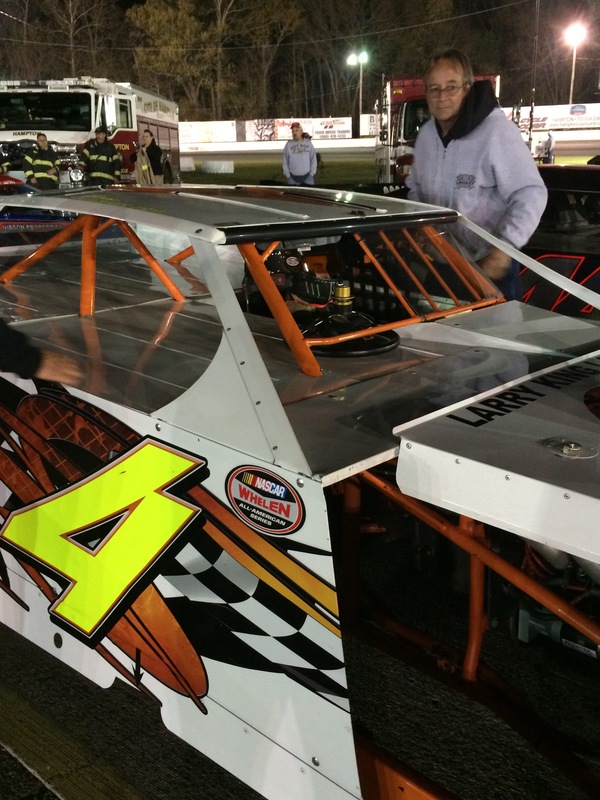 When all was said and done both Myers boys finished within the top 10 (#1 Burt P6, #4 Jason P9 first car one lap down). Luke Flemming (@LukeFlemming40), who I had the pleasure of meeting and chatting with last year when the tour came into town had a very impressive evening! Rolling off the grid P9. From what it looked like to me Flemming just saved his car, took his time picking through the field and was in position when it really counted. He had worked his way up to fifth when the caution came out with 10 laps to go and was able to hold onto the fourth position after the race ended with a green-white-checkered. Due to my “day” job, I say that with quotes because this particular case was my night job, I was unable to make it to the first part of the program. Though my boss is very good at working around my schedule I was needed to close the store this even! Once we were closed up and I got all my work complete I darted out of there and headed for the speedway. I am working to get you guys a recap from the other divisions from Saturdays race! Langley Speedway’s Larry King Law Modified’s were next to hit the track with 6 time division champion Shawn Balluzzo setting the fastest lap (90.06 mph) during qualifying to take the pole. Balluzzo as some of you may know had to sit out all but a few races of the 2013 season to correct a few health issues, then to come back and have his car totaled going head on into the wall after contact from the #11 of Jimmy Humblet. 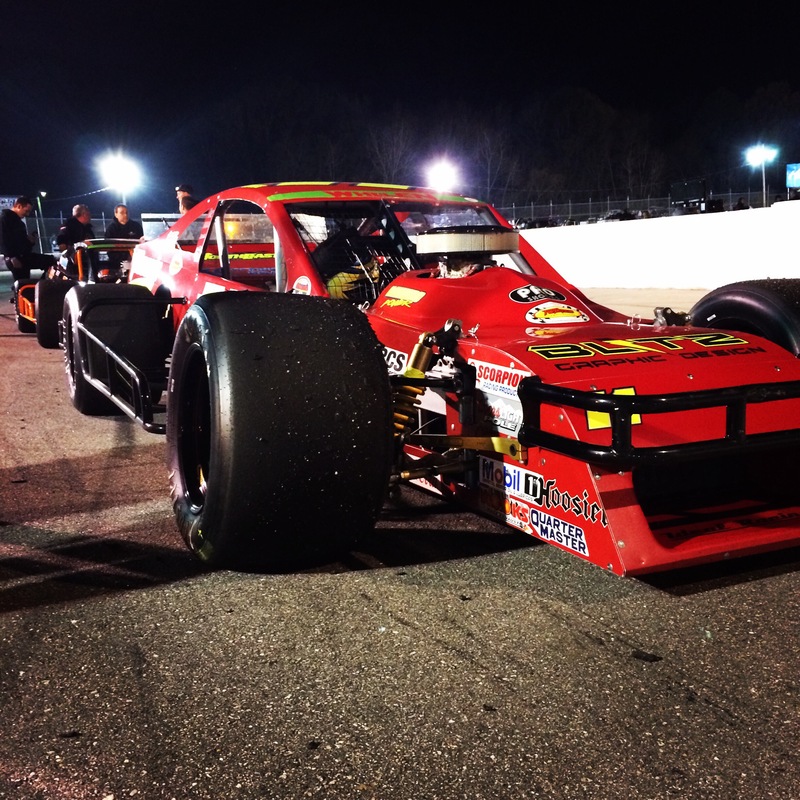 Balluzzo teamed up with Bobby Creech to build a brand new car from scratch in just three weeks to compete in the Modified Madness, shook the car down and began planning for 2014. 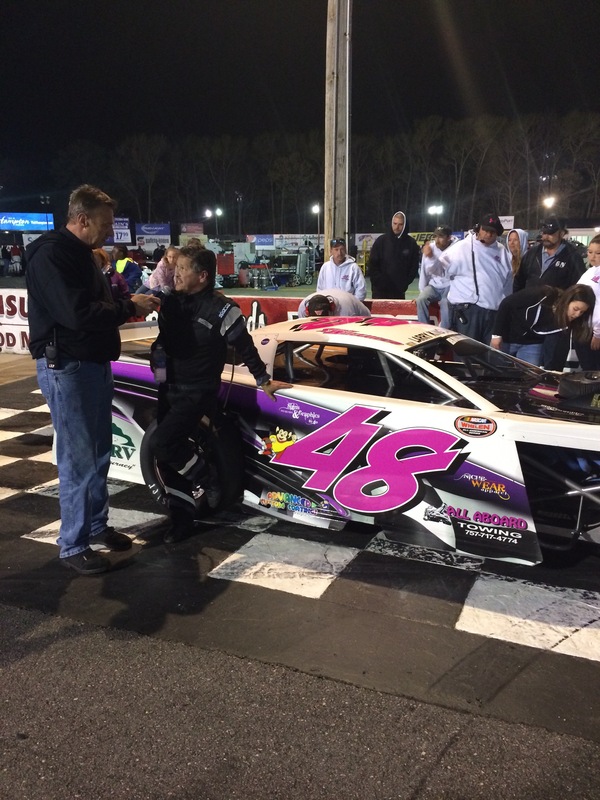 Boy did those plans pay off, with a brand new car, brand new wrap, and a brand new outlook, Balluzzo and his crew has come back to Langley with one thing on their minds… 7. 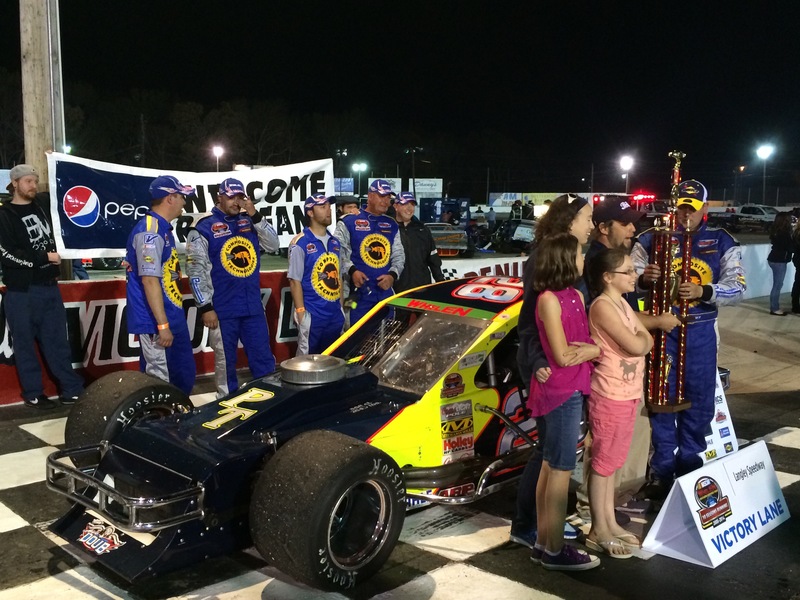 Shawn made it just that much closer Saturday night leading every lap and returning back to victory lane. Defending series champion Robbie Babb, qualified the black and orange 44 in third place but ran into trouble early only finishing 10 laps. Babb got caught up with a lap car coming out of turn two that would cause previous LMSC champion Mark Wertz – making his debut in a rather beautiful car – to collide with him and the wall which would end the night for Wertz not to mention tear up some of his equipment putting him dead last. Babb would make an attempt to complete one more lap, and that’s all he could do as he pulled into the pits calling it a night for himself! Jon Largena took the giant step over the off season as he graduates from UCARS (4 cylinder domestic, front wheel driver cars) and moves up into the modified division. Largena did run solid all day in practice, when it came time to the race I believe some nerves factored in. Largena was the cause of the races first caution has he drove into one to hard and spun into the grass all by himself. Throughout the race Largena had a few more hiccups, passed a few cars and came home 8th place on the lead lap. Now to give out my Brand New Weekly “D’oh” Award. Given to the driver who just made a move or did something that just didn’t make sense! Drum roll please… this week Lauren Edgerton gets to hold this title high in sky! She gets the blue move over flag at the stripe, Balluzzo followed by Humblet pulls up next to her and what does she do? Nothing! Its like she didn’t even know the leaders were at her door. Looked like she tried to come off the corner holding her line knocks into the side panel of Balluzzo and finishes it off by spinning in the grass. Lucky for her and the leaders, she only went for a solo spin while Balluzzo only suffered a crushed body panel. Got to wonder where her spotter was, or better yet her rear view mirror! Edgerton did finish the race in eleventh spot, three laps behind the leaders, under her own power! The Modified’s will have the next two weeks off (not counting the week of Richmond) and will return May 10 for twin 30’s. Next week the Late Model Stock cars return to the track for 100 laps, Grand Stocks will run twin 20’s, Super Trucks for 25, UCAR for 25 and the Enduro’s for 30!